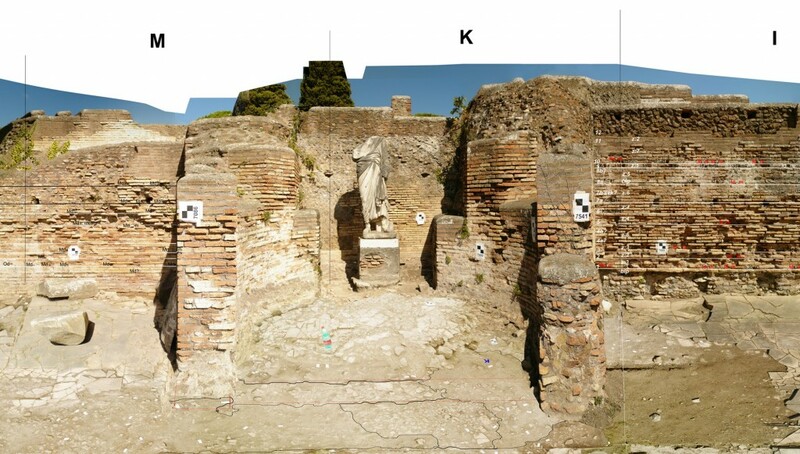 Based on the material found so far since 2010, we firstly aim to compare phenomena and patterns of late antique spolia-reuse and pavement-renovations in the Foro della Statua Erocia (FSE) and the Forum-area. Secondly we extent our studies to the remains of the walls and architectural elements (compare picture below) in order to reconstruct the Forum’s outlook in its several building-phases. Our working-hypothesis is that we can find common elements in the building-histories of the hitherto analysed areas. This allows us to re-write the last chapter(s) of Ostia’s history, the rebuilding of the Forum even after the end of epigraphic evidence from this site – exclusively based on new archaeological material. One of our aims is to date the major collapse events and the last Forum-repairs of the fifth and sixth centuries and its final collapse in later times more precisely in accordance with our relative sequences of destruction-layers and the mortar-stratigraphy. Another aim is to reconstruct the ‘lost’ stratigraphical evidence from the old excavations. By a simple archeological fine-cleaning of undocumented trenches and robbing pits of the 19th and 20th century we are able to follow the Forum’s building history back to Augustan times and to its predecessors in the republican period. Especially due to the trench-documentation with laserscanners (see picture above, compare section “Aims and Methodology” and “Why do we use laserscans?“) we are able to draw and measure profiles and sections of building sequences especially along the walls which had been partially excavated until 1938, while the dominant method was still to dig trenches along walls (“wall-searching”). By resurveying these often irregularly shaped trenches we found enough evidence to reconstruct two previously unknown monumental Forum-layouts of the first century AD and some very interesting continuity of the Forum’s central round structure (MUN) into Ostia’s republican past (“The ‘moving’ mundus”). Our main focus of interest remains on Late Antiquity however: Controversial to the simplifyed and often misleading interpretations of a ‘barbaric’ destruction or only one singular catastrophic event which ended Ostia’s monumental architecture in the fourth or early fifth century AD already, we aim to provide our new evidence of the latest building activities after collapse-catastrophies (compare picture above) to the ongoing historical discussion about the areas of continuity or change of city-life until the early middle ages (compare sections “Rewriting Late-Antiquity part 1” and “part 2“). We have collected evidence that enables us to overcome some of the traditional ideas of the decay of the Roman Empire, which still rely on topic prejudices and the predominantly philological understanding of a closed chapter called ‘Antiquity’ present in historiography since the Renaissance.